Crown Post roofs are among some of the most beautiful historic structures and are truly mediaeval. Their use became common in England from the late 13th Century onward although common in Europe dating from the 11th Century. 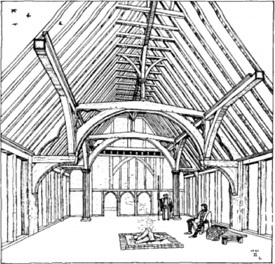 Due to improvement in the performance and roofs with side purlins along with other developments their use was phased out during the latter part of the 15th Century. 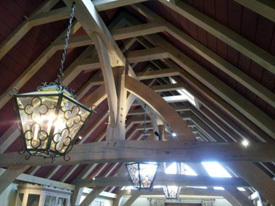 The use of crown post trusses was generally in better class buildings such as open halls and church roofs. 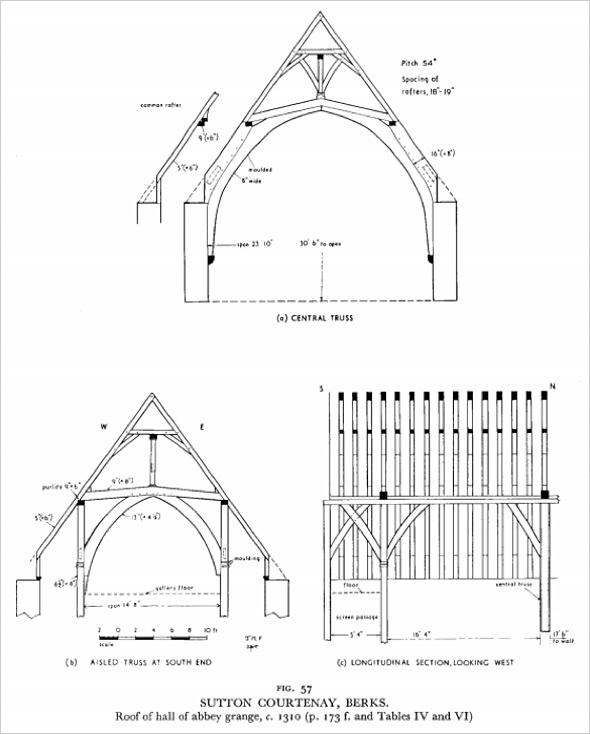 Often the tie beams of crown post roofs were heavily cranked and tapered, a device which is both decorative and structural as the tie beam is deeper in section in the centre portion of the beam where bending forces are greater. The crown post does not extend to the ridge of the roof and supports the crown purlin, a longitudinal member running the full length of the roof which, in turn, supports the collars of the rafter couples, as illustrated in the picture (right) of one of our recently completed buildings. Often crown posts were heavily moulded or decorated with elaborately carved capitals, which in an open hall house such as that illustrated below, would have been very much on show demonstrating the wealth and status of the owner. We often carve or work mouldings onto the crown post to reflect some of the historic devices used for embellishment. Either by cutting the central section of the crown post octagonally and working large lambs tongue chamfers, or by carving the central section cruciform and working broach stops where the section returns to square. Whatever device is used the opportunity for embellishments are many and difficult for the carpenter to resist! 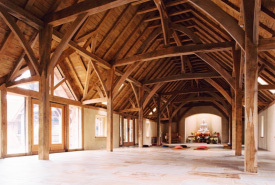 This frame made for the Buddhist community at Chithurst near Midhurst is an aisled barn with crown post trusses. Given that this particular Buddhist order finds its origins in the forests of Thailand, and this truss being most redolent of the forest with its arrangement of curved braces rising high into the roof, it seems the most appropriate choice of structure. Here we are prefabricating a trussed roof for a large dwelling near Henley on Thames. 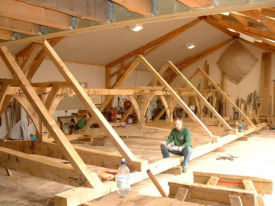 The common rafters with their collars have yet to be fabricated and trial fitted. It is a lot of carpentry hence these roofs are certainly not the cheapest form available but certainly among the most beautiful.